Fax: +43 1 40400 5511 or 5573. When I came, more or less by chance (no other attractive position was then available), into neuropathology, the field of infectious diseases of the brain fascinated me from the start. Now, almost 30 years later, this has not changed. The fight between the most sophisticated organ yet known, the human brain, and a dangerous intruder can be followed from looking on changes in tissue as seen in neuropathological tissue preparations, and sometimes unfolds like a detective story. Truly, what we see in human biopsy and autopsy specimens are usually the sequels of a battle lost to the infectious agent, be it a bacterium, virus or transmissible spongiform encephalopathy (TSE) agent ("prion"). Nevertheless, by scrutinizing the battleground, important clues emerge on what was happening, and may be made clearer by studying sequential changes in animal experiments. I have to admit that it were viral diseases of the nervous system, rather than TSEs, that caught my eye from the start. In the former, the full raging battle is frequently observed in what we call "productive" infection: the virus sneaks into its target cells and transforms them into a factory of its proprietory nucleic acids and proteins which can be well visualized in tissue sections by in situ methods such as nucleic acid hybridization or immunohistochemistry (IHC), using specific antibodies against viral proteins. The invaded brain mounts a desperate counterattack to get rid of the pathogen, by an inflammatory tissue response which, fortunately, frequently succeeds in human viral diseases. In "burnt-out" or dormant ("latent") infections, tissue changes are much less exciting, showing either little pathology or a devastated end stage after a lost fight. Then, like in other conditions with a neurodegenerative character such as Alzheimer’s disease, tissue changes observed by the neuropathologist do not reflect the ongoing action of active brain inflammation (encephalitis). This is also the case with TSEs. There is loss of nerve cells and filling of the losses by scarring glial cells (gliosis). I have learnt that even such less exciting tissue changes provide a treasure chest of clues on the origin and development of disease in the brain. Neuropathology is not only pivotal in TSE research: neuropathological examination has remained the most important tool to give a definite diagnosis of TSEs . 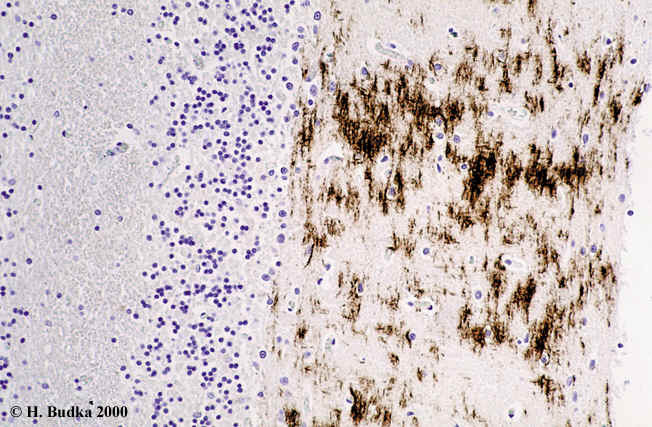 In recent years, IHC for the disease-associated prion protein (PrPsc) has emerged as an indispensable adjunct to the neuropathological confirmation of TSEs, especially in cases with equivocal histopathological changes . This personal account focuses on our own recent research, emerging points to consider and newly recognised features in the histopathology and IHC of human TSEs. A similar but more illustrated review is published elsewhere . The term TSE derives from neuropathology: damage to the brain of a non-inflammatory character (encephalopathy) with a peculiar tissue change with vacuoles (spongiform) and transmissibility to experimental animals. While all TSEs lead to fatal brain damage, spongiform change and even transmissibility are not seen in all cases. The classical histopathological features of human TSEs have been extensively described (e.g. ). The triad of spongiform change, neuronal loss, and gliosis (astro- and microglia) is the neuropathological hallmark of TSEs. Since neuronal loss and gliosis accompany many other conditions of the CNS, it is the spongiform change that is mostly specific to TSEs. This spongiform change is characterized by diffuse or focally clustered small round or oval vacuoles in the neuropil (Fig.1) of the deep cortical layers, cerebellar cortex or subcortical grey matter, which might become confluent. A spectrum of intensity may be observed, ranging from no change (Fig. 1 A) to slight or moderate (Fig. 1 B) to severe changes (Fig. 1 C). Spongiform change should not be confused with non-specific spongiosis. This includes status spongiosus ("spongiform state"), comprising irregular cavities in gliotic neuropil following extensive neuronal loss [including also lesions of "burnt-out" Creutzfeldt-Jakob disease (CJD)], "spongy" changes in brain edema and metabolic encephalopathies, and artifacts such as superficial cortical, perineuronal, or perivascular vacuolation. Focal changes indistinguishable from spongiform change may occur in some cases of Alzheimer’s and diffuse Lewy body diseases . Presence and distribution of spongiform change vary greatly between cases and disease subtypes. In sporadic Creutzfeldt-Jakob disease (CJD), the regional distribution of spongiform change in distinct patterns was shown to depend upon PrPsc fragment size and codon 129 genotype in the PrP gene, PRNP . However, some TSEs, in fact, have equivocal, little or no spongiform change, such as fatal familial insomnia (FFI) which is specifically characterised by prominent thalamic atrophy with profound astrogliosis. Then IHC for PrPsc and PRNP genotyping have a decisive diagnostic role . Current neuropathological criteria for human TSEs , including the specific diagnostic features of variant CJD (vCJD, apparently "human BSE"), are listed in Table 1. Neuronal loss appears to follow a peculiar type of cell death program, apoptosis or cellular "suicide", that is independent from local deposition of PrPsc but correlates with astrogliosis and microglial activation . Specific vulnerability of a peculiar, parvalbumin (PV) expressing subset of GABAergic neurons, a major nerve cell population of the brain with inhibitory function, was found both in human and experimental TSEs . In fact, this vulnerability was detectable already early in the incubation period and thus represents the earliest changes ever described after experimental inoculation . However, FFI, a unique hereditary prion disease with characteristic disturbances of sleep, differs in such vulnerability from all other human TSEs . We studied the serotonergic system, considered to be involved in sleep regulation and other functions, in FFI affected subjects by immunohistochemistry for the serotonin-synthesizing enzyme, tryptophan hydroxylase (TH). Quantification of neurons in median raphe nuclei showed no total neuronal loss in FFI, but a substantial increase of TH+ neurons (~62%) in FFI compared to controls . These results indicate upregulation of the serotonergic system that might represent the functional substrate of some typical symptoms of FFI, including the sleep disorder. What makes the PV+ subset of inhibitory neurons particularly vulnerable? We do not know at the moment, but are currently exploring some possibilities by inoculating mice in which some target genes such as PV and other calcium-binding proteins, or tenascin, the major component of the intercellular matrix of "perineuronal nets" around PV+ neurons, were "knocked-out". Only PV+ neurons surrounded by isolectin-B4 positive perineuronal nets were severely affected in TSEs , suggesting a factor residing in this type of extracellular matrix around PV+ neurons as modulator for the selective neuronal vulnerability. It might be speculated that components of this extracellular matrix have a binding or chaperone (catalyzing the re-folding of proteins) function in the conversion of the normal cellular PrP that is present on many cells throughout the body and abundant on nerve cells, into the misfolded and disease-associated PrPsc. Oxidative stress, or damage of cells by free reactive oxygen species, has been shown to be important in several neurodegenerative disorders. Previous in vitro studies have already demonstrated the ability of a prion protein fragment to induce oxidative stress in cultured cells. By immunohistochemistry for nitrotyrosine (NT) and heme oxygenase-1 as markers for oxidative stress, we found widespread neuronal labeling for NT in scrapie infected mouse brains, in agreement with peroxynitrite mediated neuronal degeneration . Thus damage by free radicals is a likely cause for neurodegeneration in prion disease, and antioxidants are a potential therapy of these disorders. IHC for the disease-associated PrP (PrPsc) is feasible on routinely formol-fixed and paraffin-embedded tissues and has become indispensable for the diagnostic confirmation of TSEs . Unfortunately, routine PrPsc IHC might yield a negative result in exceptional cases, especially in FFI . Most recently developed techniques such as the paraffin-embedded tissue (PET) blot or the use of Carnoy's fixative are promising alternatives to increase sensitivity for the detection of disease-associated PrPsc in tissues. However, in our European neuropathological surveillance study of human TSEs that encompasses now registration of almost 900 patients, we have seen only 2 FFI brains negative with IHC for PrPsc among tissue specimens from human TSEs. Given the long incubation periods that make experimental transmission impractical, IHC for PrPsc has also been used as surrogate marker for infectivity in peripheral tissues which are important for considerations of infectivity risks, such as the lymphoid system or the peripheral nervous system . Moreover, PrPsc is also an important marker for development, spread and distribution of pathology. However, the amount and distribution of PrPsc deposits do not always correlate with type and severity of local tissue damage . In a sequential experimental study on the time course and intensity of tissue lesioning and IHC for PrPsc in mice inoculated with a human CJD agent, PrPsc accumulation does not precede, but follow spongiform change . Could it be that the deposition of the disease-associated PrPsc is less important for development of tissue pathology than we previously thought, and be just a disease marker, similarly to the plaques and tangles of Alzheimer’s disease? Local PrPsc deposition requires the presence of neuronal but not glial elements: in pre-existing brain lesions such as infarctions in which neuronal elements had been focally destroyed and replaced by a gliotic scar, PrP deposition is absent (Fig. 2). It is important to realise that the antibodies used for IHC do not distinguish between the normal cellular PrPc that we all harbor in our brain, and PrPsc, including the widely used monoclonal 3F4 antibody. Thus it is crucial to abolish immunoreactivity of PrPc by specific pre-treatment of formol-fixed, paraffin-embedded sections. In our hand as well as that of others, a protocol using formic acid, guanidine thiocyanate, and hydrated autoclaving gave strongest and most consistent signals. Minor modifications were recently recommended . It must be noted that the possibility of pitfalls requires extensive experience in technique and interpretation. Sometimes unspecific labeling of diffuse neuronal somata, dystrophic neurites, Alzheimer amyloid and neurofibrillary tangles may be seen , probably representing incomplete abolishment of PrPc immunoreactivity. Thus interpretation of positive labeling has to be made by experienced observers and must consider the type of obtained signals. Large bihemispheric sections are most useful to study the distribution of accumulated PrPsc and demonstrate that abundant PrPsc deposits occur irrespective of the absence or the presence of profound brain atrophy . Characteristic patterns of PrPsc deposition are synaptic, patchy/perivacuolar, and plaque types, which may overlap in the individual brain . Frequencies of these patterns differ between cerebral and cerebellar cortex. Synaptic-type deposits and unicentric PrPsc plaques occur both in CJD and Gerstmann-Sträussler-Scheinker disease (GSS), while abundant multicentric plaques are peculiar to GSS . Plaque-like deposits are the only type of PrPsc deposits extending to the subcortical white matter and are more frequent than true kongophilic Kuru-type plaques that are well visible already without IHC. While very rarely "florid" or "daisy-like" plaques (fibrillary amyloid plaques surrounded by spongiform vacuoles) may be observed in other TSEs , their prominence, well visible already in hematoxylin and eosin stain, is restricted to vCJD (Fig. 3). Again, type and distribution of PrPsc deposition in sporadic CJD were shown to depend upon PrPsc fragment size and PRNP codon 129 genotype . PrP deposits are extremely scant or absent in FFI. If they occur, they are usually seen best in the molecular layer of the cerebellar cortex (Fig. 4) . Similar linear deposition patterns may be seen in other hereditary TSEs. Most recently, we described new patterns of granular ganglionic and tiny adaxonal PrPsc deposits in spinal and vegetative ganglia, spinal roots and peripheral nerves in rare human TSE cases and abundantly in experimental scrapie . It remains to be established by sequential studies whether this involvement of the peripheral nervous system reflects centripetal or centrifugal spread of PrPsc deposition and follows the pathways of travel by the infectious agent. However, when PrPsc is considered as a surrogate marker for infectivity, such prominent involvement of the peripheral nervous system, ubiquitous in the body, gives second thoughts on the distribution of infectivity in animals TSEs such as scrapie and BSE, and the safety measures to be derived thereof. Neuropathology has contributed, and will continue to do so, important research clues on the causes for nervous system damage in TSEs. Given the concern about increasing numbers of vCJD cases in the UK and elsewhere and its potential as a hazard for human-to-human transmission e.g. by blood , neuropathology will remain essential in the surveillance and definite diagnosis of all types of human TSEs. Unfortunately, neuropathology so far has contributed little to the still unresolved nature of the TSE agent . By identifying tissue and cell components which may be involved in the conversion process of the normal to disease-associated PrP, neuropathology might contribute to support or devaluate the prion or protein-only hypothesis which still needs to stand the test of time. Neuropathological examination has remained the most important tool to give a definite diagnosis of human transmissible spongiform encephalopathies (TSEs) and visualizes the result of the battle lost by the brain to the TSE agent. The clinico-pathological features (phenotype) including histopathology and immunohistochemistry (IHC) for the disease-associated prion protein, PrPsc, depends upon PrPsc fragment size and codon 129 genotype in the PrP gene, PRNP. However, some TSEs have little or no spongiform change or detectable PrPsc, such as fatal familial insomnia (FFI). Then IHC or Western blotting for PrPsc, and molecular genetic examination have emerged as an indispensable adjunct to the neuropathological confirmation of TSEs, especially in cases with equivocal histopathological changes. IHC for PrPsc requires appropriate technique, has some pitfalls and thus should be interpreted by experienced observers. The amount and distribution of PrPsc deposits do not always correlate with type and severity of local tissue damage. PrPsc is deposited by the neuronal parenchyma only; in pre-existing tissue lesions such as scarred infarctions with prominent gliosis, PrPsc does not accumulate. Most recently, new patterns of granular ganglionic and tiny adaxonal PrPsc deposits were discovered in the peripheral nervous system in rare human TSE cases and experimental scrapie, with possible implications for the distribution of infectivity in the body. There is early, severe and selective loss of a peculiar parvalbumin-expressing subset of inhibitory GABAergic neurons both in human and experimental TSEs, and evidence for oxidative stress in the neuropathogenesis of TSE, as in other neurodegenerative diseases such as Alzheimer’s. Thus neuropathology has been able to identify crucial events in the TSE battlefield and provides a rationale for possible therapeutic targets. Encephalopathy with prion protein (PrP) immunoreactivity (plaque and/or diffuse synaptic and/or patchy/perivacuolar types). multiple fibrillary PrP plaques surrounded by a halo of spongiform vacuoles ("florid" plaques, "daisy-like" plaques) and other PrP plaques, and amorphous pericellular and perivascular PrP deposits especially prominent in the cerebellar molecular layer. Encephalo(myelo)pathy with multicentric PrP plaques. Thalamic degeneration, variably spongiform change in cerebrum. 4. Kuru: Spongiform encephalopathy in the Fore population of Papua-New Guinea. Almer, G., Hainfellner, J. A., Brücke, T., Jellinger, K., Kleinert, R., Bayer, G., Windl, O., Kretzschmar, H. A., Hill, A., Sidle, K., Collinge, J., and Budka, H. (1999): Fatal familial insomnia: a new Austrian family. Brain 122, 5-16. Belichenko, P. V., Miklossy, J., Belser, B., Budka, H., and Celio, M. R. (1999): Early destruction of the extracellular matrix around parvalbumin-immunoreactive interneurons in Creutzfeldt-Jakob disease. Neurobiol Dis 6, 269-279. Bell, J. E., Gentleman, S. M., Ironside, J. W., McCardle, L., Lantos, P. L., Doey, L., Lowe, J., Fergusson, J., Luthert, P., McQuaid, S., and Allen, I. V. (1997): Prion protein immunocytochemistry -- UK five centre consensus report. Neuropathol Appl Neurobiol 23, 26-35. Budka, H. (1997a): The human prion diseases: from neuropathology to pathobiology and molecular genetics. Final report of an EU Concerted Action. Neuropathol Appl Neurobiol 23, 416-422. 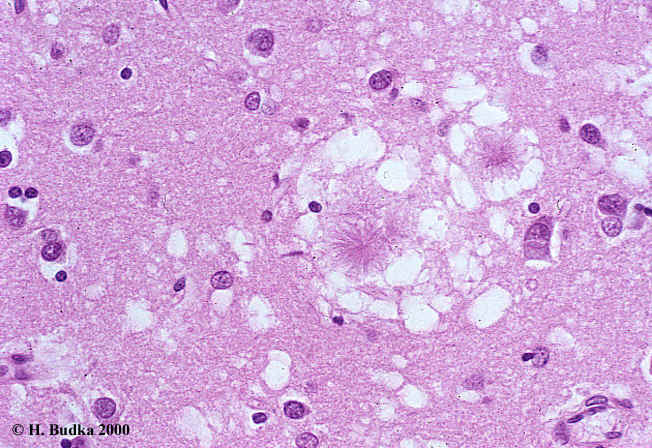 Budka, H. (1997b): Transmissible spongiform encephalopathies (prion diseases), pp. 449-474. In J. H. Garcia (Ed. ): Neuropathology. The diagnostic approach, Mosby, St.Louis. 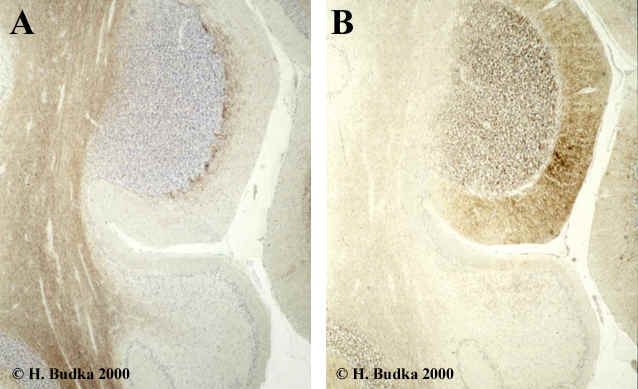 Budka, H. (2000a): Histopathology and immunohistochemistry of human transmissible spongiform encephalopathies (TSEs). Arch Virol (in press). Budka, H. (2000b): Prions and transfusion medicine. Vox Sang 78 (suppl 2), 231-238. Budka, H., Aguzzi, A., Brown, P., Brucher, J.-M., Bugiani, O., Gullotta, F., Haltia, M., Hauw, J.-J., Ironside, J. W., Jellinger, K., Kretzschmar, H. A., Lantos, P. L., Masullo, C., Schlote, W., Tateishi, J., and Weller, R. O. (1995): Neuropathological diagnostic criteria for Creutzfeldt-Jakob disease (CJD) and other human spongiform encephalopathies (prion diseases). Brain Pathol 5, 459-466. Chesebro, B. (1999): Minireview: Prion protein and the transmissible spongiform encephalopathy diseases. Neuron 24, 503-506. Dorandeu, A., Wingertsmann, L., Chrétien, F., Delisle, M.-B., Vital, C., Parchi, P., Montagna, P., Lugaresi, E., Ironside, J. W., Budka, H., Gambetti, P., and Gray, F. (1998): Neuronal apoptosis in fatal familial insomnia. Brain Pathol 8, 531-537. Giaccone, G., Canciani, B., Puoti, G., Rossi, G., Goffredo, D., Iussich, S., Fociani, P., Tagliavini, F., and Bugiani, O. (2000): Creutzfeldt-Jakob disease: Carnoy's fixative improves the immunohistochemistry of the proteinase K-resistant prion protein. Brain Pathol 10, 31-37. Groschup, M. H., Beekes, M., McBride, P. A., Hardt, M., Hainfellner, J. A., and Budka, H. (1999): Deposition of disease-associated prion protein involves the peripheral nervous system in experimental scrapie. Acta neuropathol 98, 453-457. Guentchev, M., Groschup, M. H., Kordek, R., Liberski, P. P., and Budka, H. (1998): Severe, early and selective loss of a subpopulation of GABAergic inhibitory neurons in experimental transmissible spongiform encephalopathies. Brain Pathol 8, 615-623. Guentchev, M., Hainfellner, J.-A., Trabattoni, G. R., and Budka, H. (1997): Distribution of parvalbumin positive neurons in brain correlates with hippocampal and temporal cortical pathology in Creutzfeldt-Jakob disease. J Neuropathol Exp Neurol 56, 1119-1124. Guentchev, M., Voigtländer, T., Haberler, C., Groschup, M. H., and Budka, H. (2000): Evidence for oxidative stress in experimental prion disease. Neurobiol Dis (in press) 7. Guentchev, M., Wanschitz, J., Voigtlaender, T., Flicker, H., and Budka, H. (1999): Selective neuronal vulnerability in human prion diseases. Fatal familial insomnia differs from other types of prion diseases. Am J Pathol 155, 1453-1457. Hainfellner, J. A., Brantner-Inthaler, S., Cervenakova, L., Brown, P., Kitamoto, T., Tateishi, J., Diringer, H., Liberski, P. P., Regele, H., Feucht, M., Mayr, N., Wessely, P., Summer, K., Seitelberger, F., and Budka, H. (1995): The original Gerstmann-Sträussler-Scheinker family of Austria: divergent clinicopathological phenotypes but constant PrP genotype. Brain Pathol 5, 201-211. Hainfellner, J. A., and Budka, H. (1996): Immunomorphology of human prion diseases, pp. 75-80. In L. Court, and B. Dodet (Eds): Transmissible Spongiform Encephalopathies: Prion Diseases, Elsevier, Paris. Hainfellner, J. A., and Budka, H. (1999): Disease associated prion protein may deposit in the peripheral nervous system in human transmissible spongiform encephalopathies. Acta Neuropathol 98, 458-460. Hainfellner, J. A., Jellinger, K., Diringer, H., Guentchev, M., Kleinert, R., Pilz, P., Maier, H., and Budka, H. (1996): Creutzfeldt-Jakob disease in Austria. J Neurol Neurosurg Psychiat 61, 139-142. Hegyi, I., Hainfellner, J. A., Flicker, H., Ironside, J. W., Hauw, J. J., Tateishi, J., Haltia, M., Bugiani, O., Aguzzi, A., and Budka, H. (1997): Prion protein immunocytochemistry: reliable staining protocol, immunomorphology, and diagnostic pitfalls. Clin Neuropathol 16, 262-263. Hill, A. F., Butterworth, R. J., Joiner, S., Jackson, G., Rossor, M. N., Thomas, D. J., Frosh, A., Tolley, N., J E Bell, Spencer, M., King, A., Al-Sarraj, S., Ironside, J. W., Lantos, P. L., and Collinge, J. (1999): Investigation of variant Creutzfeldt-Jakob disease and other human prion diseases with tonsil biopsy samples. Lancet 353, 183-189. Kordek, R., Hainfellner, J. A., Liberski, P. P., and Budka, H. (1999): Deposition of the prion protein (PrP) during the evolution of experimental Creutzfeldt-Jakob disease. Acta neuropathol 98, 597-602. Kretzschmar, H. A., Ironside, J. W., DeArmond, S. J., and Tateishi, J. (1996): Diagnostic criteria for sporadic Creutzfeldt-Jakob-disease. Arch Neurol 53, 913-920. Parchi, P., Giese, A., Capellari, S., Brown, P., Schulz-Schaeffer, W., Windl, O., Zerr, I., Budka, H., Kopp, N., Piccardo, P., Poser, S., Rojiani, A., Streichemberger, N., Julien, J., Vital, C., Ghetti, B., Gambetti, P., and Kretzschmar, H. (1999): Classification of sporadic Creutzfeldt-Jakob disease based on molecular and phenotypic analysis of 300 subjects. Ann Neurol 46, 224-233. Schulz-Schaeffer, W. J., Tschoke, S., Kranefuss, N., Drose, W., Hause-Reitner, D., Giese, A., Groschup, M. H., and Kretzschmar, H. A. (2000): The paraffin-embedded tissue blot detects PrP(Sc) early in the incubation time in prion diseases. Am J Pathol 156, 51-56. Van Everbroeck, B., Palsa, P., Martina, J.-J., and Cras, P. (1999): Antigen retrieval in prion protein immunohistochemistry. J Histochem Cytochem 47, 1465-1470. Wanschitz, J., Klöppel, S., Jarius, C., Birner, P., Flicker, H., Hainfellner, J. A., Gambetti, P., Guentchev, M., and Budka, H. (2000): Alteration of the serotonergic nervous system in fatal familial insomnia. Ann Neurol (in press). WHO (1998): Global surveillance, diagnosis and therapy of human transmissible spongiform encephalopathies: report of a WHO consultation. Geneva, Switzerland, 9-11 February 1998, pp. WHO/EMC/ZDI/98.9, WHO, Geneva.